The visit of the island starts in the bay of Punat where we get on the boat to reach the islet of Košljun. There is the Franciscan convent with library and an ethnological museum. 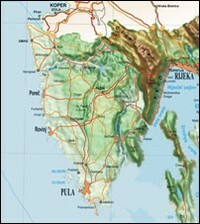 The tour continues with the visit of the town of Krk. The island tour ends in the little town of Vrbnik with the wine tasting. Vrbnik is situated on a high reef overlooking the sea and it is famous for its excellent wine - Vrbnička Žlahtina. Price includes: guide, transfers, entrance fees and wine tasting. Join our tour to see Red, Grey and White Istria. You will see medieval towns, situated on picturesque hilltops. Cities and towns have beautiful Roman buildings, Gothic and baroque villas, churches, squares etc. We will visit Poreč, Rovinj and Pula and we will have lunch in a traditional Istrian restaurant. Price includes: guide, bus and lunch. 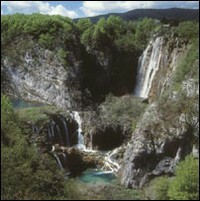 This national park is included on the UNESCO list of world nature heritage. Nature has created 16 spectacular lakes, connected by stunning waterfalls and cascades. A full day tour, starting early in the morning and returning just for your dinner. Price includes: bus, guide, entrance ticket. 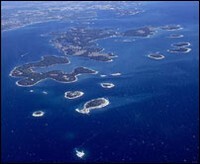 The Brijuni archipelago includes a group of 14 islands and islet, also famous for their archeological findings. A four-hour ride on a tourist train will take you to the safari park. Our guide will also show you the remains of a Byzantine fortification from the 2nd century B.C. as well as a Roman summer residence from the 1st century A.D.
Price includes: bus, guide and entrance ticket. 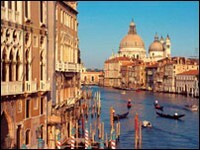 During the sail to one of the most beautiful world's towns, our guide will give you basic information on Venice. Upon arrival in Venice we will see St. Mark's Square and Academia Bridge. Price includes: bus, boat and guide. Pula is an old Roman town, rich in architectural monuments of extraordinary importance, among which the most magnificent is the amphitheater built in the 1st century AD. The tour includes the visit to the amphitheater, the Arch of Sergius, the Roman forum, Temple of Augustus. A panoramic drive offers us a picture of the port in the centuries following the fall of the Roman empire until our days. 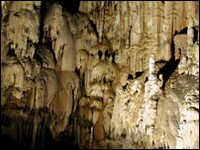 Price includes: bus, guide and entrance fees. This is a trip for all those who love nature. This underground beauty is 20 km long and has a constant temperature of 9 degrees Celsius. An electric train will take us through one part, after which we will walk for about two kilometers through the most beautiful part of the caves. You will see one of the most beautiful rivieras on the Adriatic. Many sunny bays, pebble beaches, isolated islets, crystal clear seawater and attractive tourist resorts. Price includes: boat ride and a welcome drink of local brandy. On the Croatian sea there are many places for fishing. You can choose the whole day or half day "BIG GAME FISHING & CLASSIC FISHING". In price included: boat, fuel, skipper, fishing licence, fishing equipment, baits, boat cleaning. Fish up to 5 kg is not included in price. Full day tour by boat. Available only during high season. Boat ride along the coast to the island of Krk and Cres. Free time for swimming, seawater activities and sunbathing. The price includes: boat ride, lunch (on board or in restaurant), fruit, music.